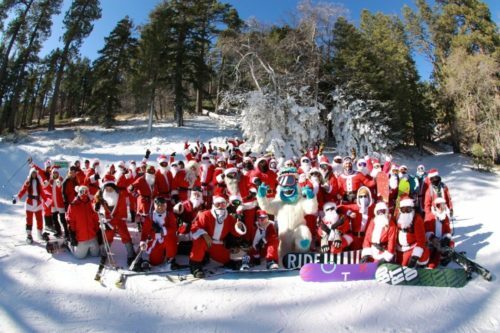 Wrightwood, CA–Skiers and snowboarders dressed in Santa Claus costumes will head to Mountain High this Sunday to participate in the fourth annual Santa Sunday. This holiday event serves as a fundraiser for Protect Our Winters, a climate change advocacy group for the snow sports community. Every Santa who attends receives a free lift ticket valued at $84 with a $20 minimum donation to Protect Our Winters. Protect Our Winters, a nonprofit charity, seeks to engage and mobilize the snow sports community to lead the fight against climate change through educational initiatives, advocacy and community-based activism. To take part in Santa Sunday, guests are asked to pre-register for the event and donate a minimum of $20 to Protect Our Winters. Receipts for online donation must be presented at registration to claim a day ticket (an 8-hour ticket is regularly $84). Once a skier or snowboarder has successfully registered, including making her/his donation, that participant must wear a Santa suit complete with hat, beard, coat, belt and pants to Mountain High on December 16. Participants must pick up their tickets, sign liability forms and be at the Snowflake Chairlift at 9:00 a.m. to participate in the Santa Sunday group ride. · 8:00 a.m. – Arrive early, pick up ticket in Big Pines Base Lodge. Bring Protect Our Winters donation receipt, photo ID and completed Santa liability form.